The Atholl Munro summits of Beinn Dearg and Carn a'Chlamain along with the Corbett peak of Beinn Mheadhonach, lie some distance from the nearest road. Fortunately there are rough tracks that reach into the area, perfect for a spot of trail-biking. 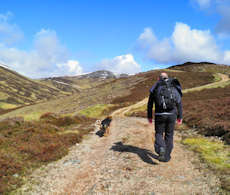 The hills themselves, though not particularly high, are expansive with fine views from their summits to the Cairngorms to the north, Drumochter to the west and the Perthshire hills to the south. 2 days biking and hiking to high mountains in the Eastern Highlands. Cycle along fine tracks into remote areas. 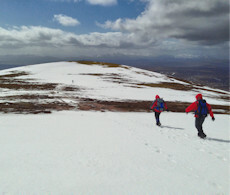 Reach vantage points from where expansive views can be enjoyed over the Perthshire Hills, Cairngorms and Beinn a'Ghlo. Bag the Munros Beinn Dearg and Carn a'Chlamain and possibly the Corbett Beinn Mheadhonach. A 2 day guided hiking and trail-biking event in the Eastern Highlands with one of our experienced and qualified leaders. We start this day from Calvine, just off the A9 and a few miles to the north of Blair Atholl. 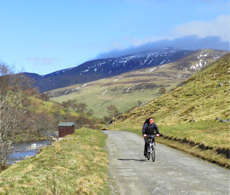 On bikes, we'll cycle up a fine track over Colrig and into the heart of Glen Bruar. Following the Water of Bruar, we'll reach Bruar Lodge and leave our bikes. On foot, it's a hike over steep grass and heather ground to reach Beinn Dearg's summit plateau, with the top perched above some boulderfield and from where fine views can be savoured. We can either return the way we came, or for more variation, pick our way down on one of the other hillsides to the north, exploring the remote location before reaching our bikes. A mile of so to the north of Blair Atholl is Old Bridge of Tilt and we'll start our day from here. On bikes, we'll head north along a fine track following the fast flowing River Tilt through Glen Tilt. This is a lovely glen with ever-changing views. After an hour or so, we'll reach the foot of Carn a'Chlamain and leave our bikes. On foot, we'll follow a bulldozed track uphill to gain Carn a'Chlamain's south-east shoulder, from where it's a pleasant hike to the summit. We can return the same way, or alternatively continue on a circular route to summit Beinn Mheadhonach before returning to our bikes via Gleann Mhairc. The routes have good tracks lower down with generally grassy slopes leading to wide plateaux higher up. There is a little boulderfield on the final approaches to both Munro summits. 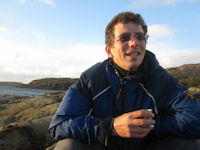 Although we would rate the hiking on the days as 'moderate', including the cycling, we have classed them as 'demanding'. Leading the event on 25-26 October'19. 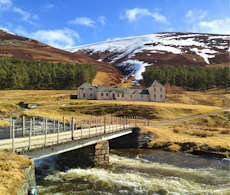 Blair Atholl and Calvine are the starting points for the days, a few miles apart, just off the A9. There are good transport links to Blair Atholl. Pitlochry, a few miles to the south of Blair Atholl is the nearest town with good facilities, including shops, restaurants and cafes.